Waiting for the bridge to Hillsboro Inlet off Pompano Beach, Florida, required about ten minutes of jockeying in a determined cross current. There was little wind, but the approach to this bridge is short, and it doesn’t leave a lot of room for error—a situation that could’ve quickly become “interesting.” I felt the current catch my sleek, lowprofile, Euro-style test boat, the Newport 71 SS4, and wondered what would happen next. 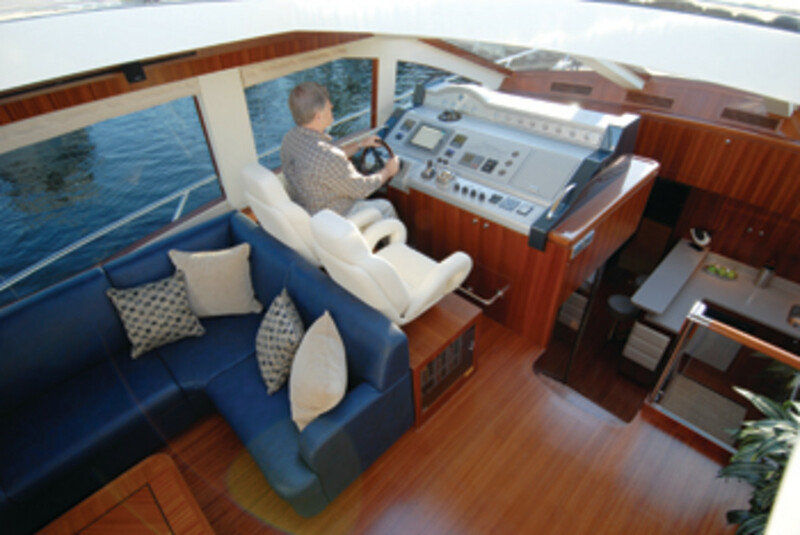 Trey Beasley, a principal at Newport’s dealer, American Global Yacht Group, nonchalantly discussed the matched grain of this vessel’s standard cherrywood interior (teak is also available as standard) as he glanced at the Volvo Penta IPS joystick and engaged not two or three, but four 435-bhp Volvo Penta IPS 600s and nudged the 71 back on track. He then slid this massive express cruiser sideways to the current, centering her as the bridge opened. We motored through the span without a hint of drift to one side or the other. The virtues of IPS shone through, reducing what could’ve been a tense moment to a pleasant discussion about satin- and high-gloss interior veneers. To further drive home the point, consider that this is a 71- foot, 74,000-pound boat, which, when turned beam-to, would just about measure the width of the bridge. I couldn’t wait to get a hand on her wheel. The ocean was nearly glass calm as Beasley prepared to show me the sporty side of this cruiser. 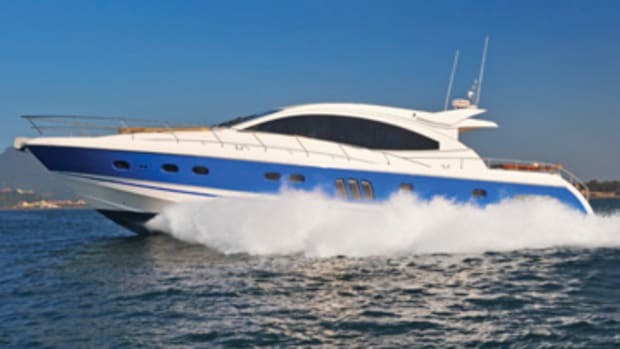 I set up my radar gun to shoot from starboard as he ran the vessel from the twin-seated, portside helm station, complete with standard Raymarine electronics package (radar, plotter, autopilot, and VHF), as well as Volvo Penta’s electronic shifters and the aforementioned joystick. In less than 12 seconds, the 71 was on plane and rapidly moving to WOT. Bow rise was minimal, and the view out the three raked, superstructure-spanning windows remained clear. I was recording solid numbers, like a 31-mph cruise speed at 3250 rpm, while the combined fuel burn of all four motors was a mere 70 gph. 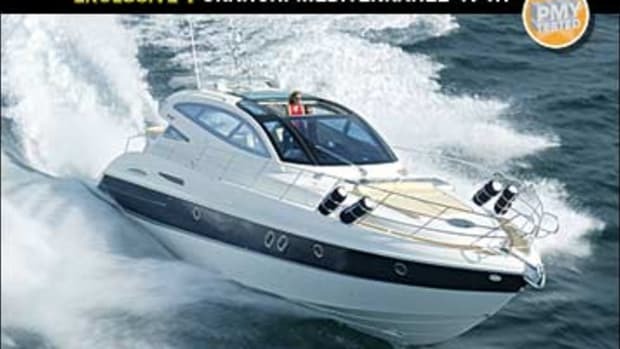 At this speed, my test boat could make 417 statute miles based on her standard 1,200-gallon fuel capacity. She ran silent, too: About the only sound my decibel meter was picking up was water impacting the hull. At cruise speed, I got a top reading of 78 dB-A (65 is the level of normal conversation), but even when the 71 was on her pins at 35 mph (see “By the Numbers,” for full test data), decibels never rose above 79. 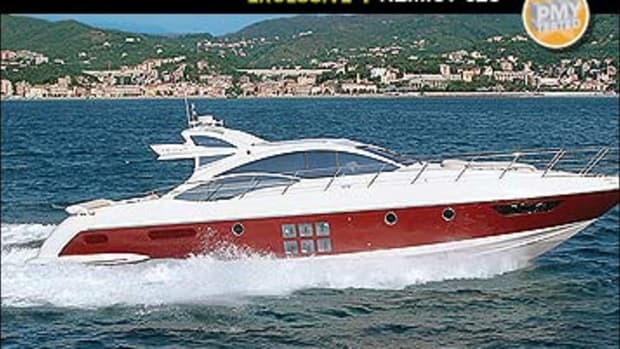 This boat’s smooth-running and quiet. The smooth-running part is helped by the fact that my test boat sports an 11-degree transom deadrise with a relatively fine entry (a nearly flat ocean didn’t hurt). Supporting this design and adding to the silence is a hull of solid fiberglass below the waterline, while above it’s vacuum-bagged Divinycell foam coring, as are the stingers, which are bonded to the hull and encapsulated in layers of cloth and resin. All bulkheads and subfloors are also cored and vacuum-bagged to help reduce weight while adding strength. 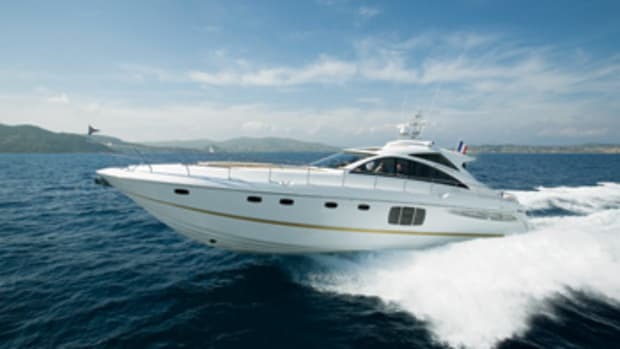 The lack of propshafts and the potential vibration they would transmit through the hull is another factor in keeping engine-born noise to a minimum. In fact, the only real “noise” I heard all day was from the optional ($79,000) retractable sunroof in the helm area as it opened and closed. It moved slowly and sounded a bit creaky, but when open, bathed the helm in light and air. Equally cool was the fact that the boat was just as quiet underway with the roof open as she was with it closed. All that light did a lot to open up this already-voluminous interior. The saloon, which is accessed from the teak cockpit via a sliding-glass door, has a standard L-shape settee to port that easily sits six adults and offers the best view of the Toshiba LCD TV across from it.Worth noting here is that the saloon bar is just to starboard of the sliding-glass door and protrudes into the the area; entering from the cockpit requires you to side step it. Beasley says this will be corrected on future models. One place with a flawless entry is the galley down, which benefits from those raked windows 12 feet above its Corian countertops. The open steps leading down here and the abundance of ambient light eliminate any cave-like feeling. The galley is more than a showpiece; it’s totally functional with a complete assortment of GE appliances from the standard Profile convection oven to the trash compactor. If you’re into long-range cruising, four drawer-type Sub-Zeros (also standard) will keep lots of provisions cool, be they fresh or frozen. 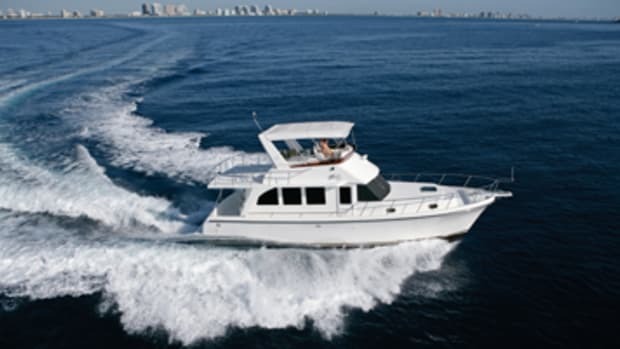 As spacious as the saloon and galley are, the 71’s engine room is elbowroom-challenged. Your initial reaction might be, “Of course it is, there are four motors in there.” But that isn’t the reason. In fact, I was impressed that these engines could be positioned in this space with room to slide in between them. There’s even blue LED rope lighting around them, which doesn’t add much in the way of functionality but sure does look nice. The space issue is actually related to the large and optional ($39,500) tender garage extending into the area and over the powerplants. When I stepped into the ER, which is accessed via seven nearly vertical steps to the port side of the cockpit just aft of the saloon bulkhead, the initial head room was about 6&apos;3". But to get to the motors, I had to crawl on my knees (I’m 5&apos;7"). And access to the collars and pod drives is better achieved through the hatch in the aft section of the garage. Beasley says the garage can accommodate a tender of nearly 11 feet LOA if its nose is slightly deflated. Given that the 71’s optional hydraulic swim platform ($44,000) spans a majority of the vessel’s 17&apos;6" beam, I’d rather add some removable chocks and mount the tender there, in which case the ER would become as open as the galley and saloon and much more consistent with this vessel’s mission of being a spacious express cruiser. And interestingly, just forward the ER are the crew quarters, which offer two wide, six-foot-plus-long athwartships bunks, and an en suite head with shower stall and MSD. This is one of the largest crew quarters I’ve seen on a vessel of this size. 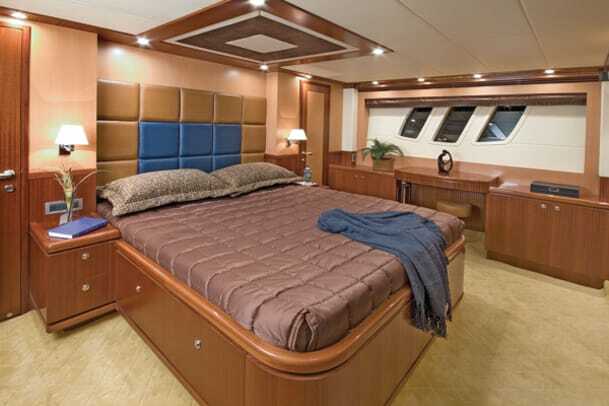 The full-beam master stateroom is also quite large with its standard king-size berth, walk-in closet, and en suite head. 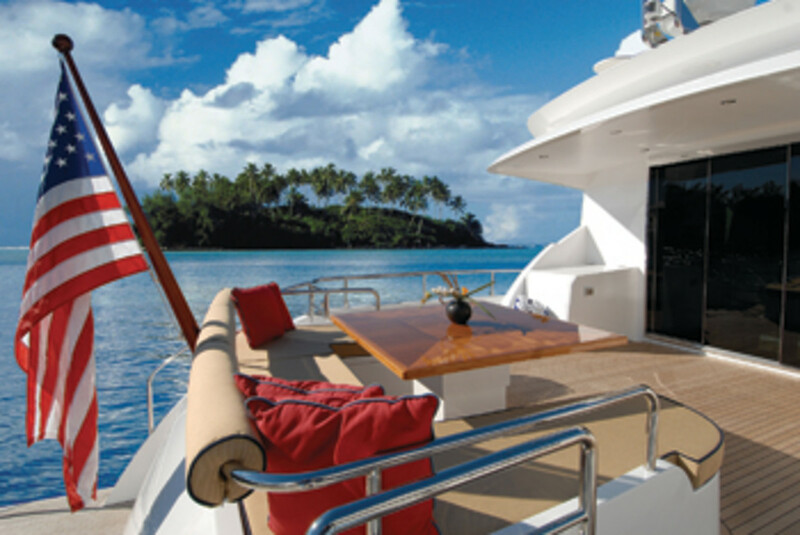 The forepeak VIP offers guests a queen, and the port guest cabin aft of it features a double berth. While a nap in the master seemed tempting, I wanted that wheel time. After getting it, I can say that the 71 felt just as seamless under my fingers as she appeared during the speed runs.With the joystick, I could easily spin her within her length and slide her sideways with just a finger’s input. When I flattened the throttles, she smoothly came up on plane, and with minimal tab (less than half), her trim angle never exceeded 3.5 degrees. She did lean into hardover turns at speed, which required a little ducking to the see what was to the inboard side, but nothing too dramatic. 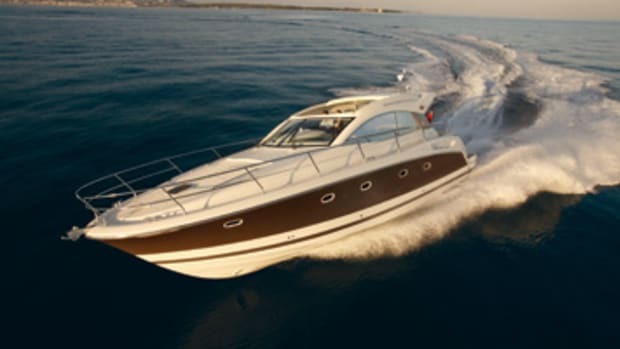 The Taiwan-built Newport 71 SS4 offers a solid turn of speed, spectacular handling in both close quarters and open water, spacious accommodations, and a fine fit and finish. 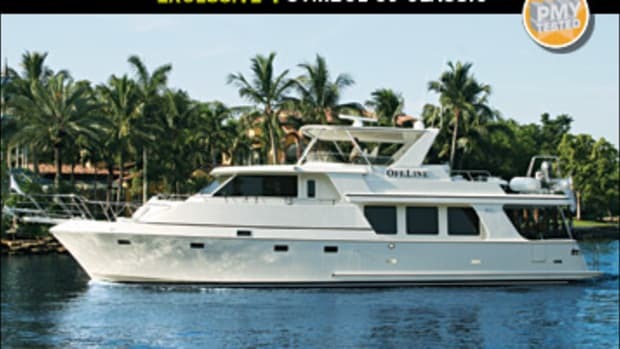 Add in her respectable cruising range and you get a yacht whose travels should keep your logbook full while adding a library of on-the-water memories. 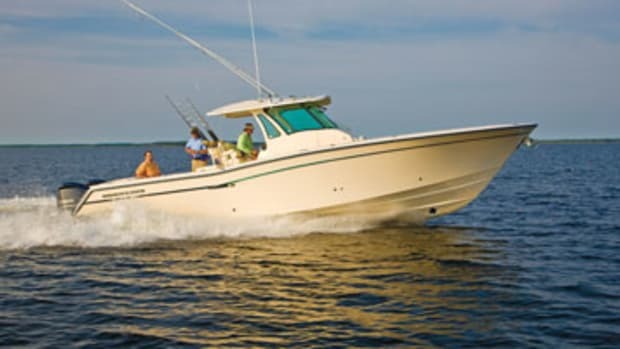 One of the well-documented benefits of an IPS-equipped boat is maneuverability in close quarters. With 1500 rpm available at the helm when the 71’s joystick is engaged, beating back currents, sliding in side-to, and backing in without a piling bump are almost guaranteed with only minimal practice. 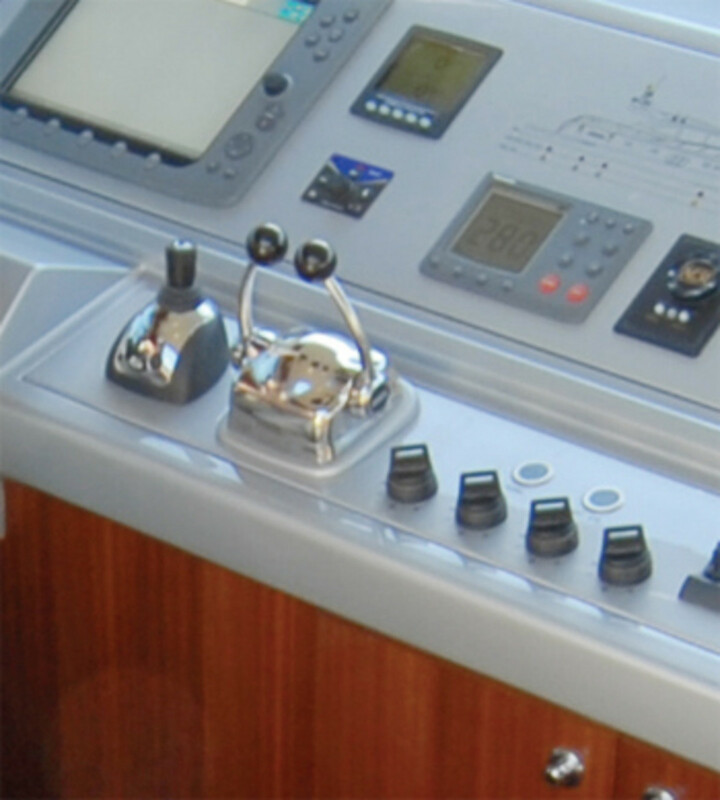 To further ease handling, Newport offers an optional ($12,000) joystickequipped cockpit docking station. Since you can’t really see beyond the cockpit table from the port-side helm area, it’s well worth the money for the peace of mind it provides. From this position, you get a clear view of the vessel’s swim platform and starboard side. We used this station when backing the 71 into a skinny slip and were able to flawlessly creep her past a broken and submerged piling one inch at a time. —P.S. 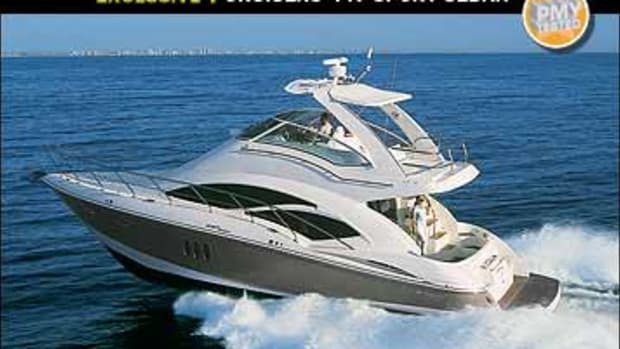 Contact: Newport (954) 767-8305. www.powerandmotoryacht.com/newport/. 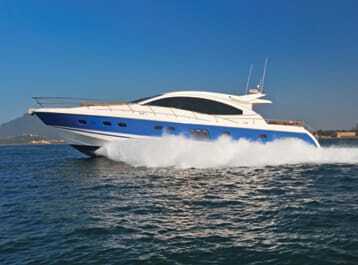 This article originally appeared in the October 2009 issue of Power & Motoryacht magazine.